- “chemical” means an element, a compound or mixture that is exploited or made by humans from natural or artificial raw materials. - “substance” means an element or a compound, including any impurities generated from processing and any additives necessary to preserve the stability of physical and chemical properties but excluding solvents which may be separated without changing the characters of the substance. - “mixture” means a combination of two or more substances which do not react under normal conditions. - “chemical-related activities” refer to the investment, manufacturing, bottling, packaging, trading, import, export, transport, storage, preservation, use, research and testing of chemicals, and treatment of discarded chemicals and chemical waste. 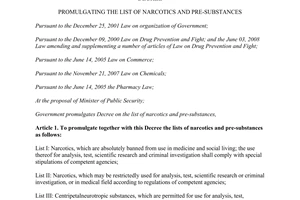 Pursuant to the Law on Drug Prevention and Control, “precursors” are chemicals essential for the preparation and production of narcotic drugs and are included in the list of precursors announced by the Government. 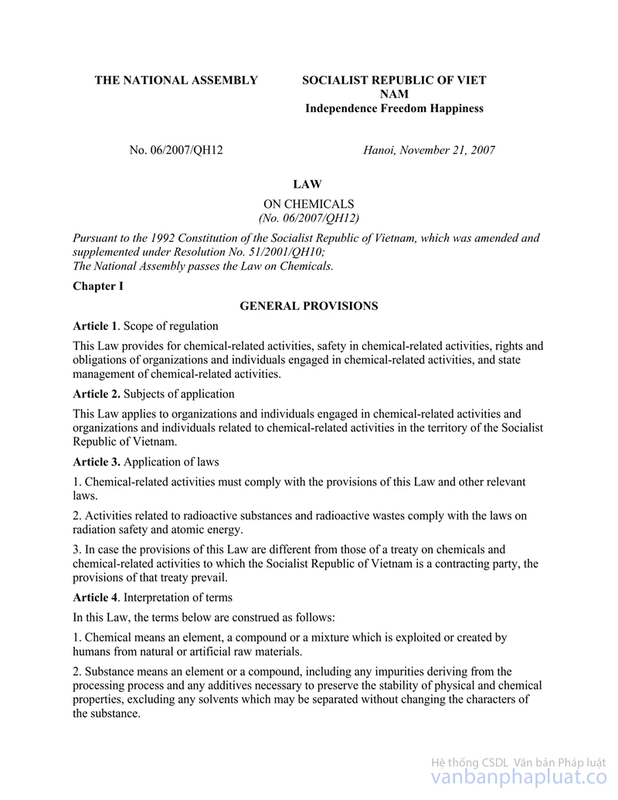 Pursuant to the Law on Chemicals, “chemical” means an element, a compound or mixture that is exploited or made by humans from natural or artificial raw materials. On the other hand, pursuant to Clause 1 Article 6 of Decree No. 58/2003/ND-CP “An application for import/ export license must specify the following contents: Name and address of importer/exporter; import/export purposes; name and address of manufacturer; name, quantity and content of narcotic substance, precursor, narcotic drug or psychotropic drug to be imported/exported; vehicle and proofs of satisfaction of requirements for safe transport; time and name of the checkpoint through which imports/exports are transported". Thus, the regulation on “content” mentioned above is applied to mixtures. The list of chemicals only specifies names, CAS codes and HS codes of pure chemicals. Actually, almost chemicals in general and industrial precursors in particular exist in the mixture form which contains two or more components with different contents as well as different physiochemical properties and hazards, and may be assigned with a HS code different from HS codes of its component substances. In chemistry sector, and pursuant to international practices, all chemicals, including both hazardous substances and mixtures, must be properly managed and controlled. Applying HS codes to imported/exported goods is under the authority of Customs agencies. Thus, HS codes specified in lists enclosed with the Decree No. 113 are used for reference purpose (as noted at such lists) in order to identify substances. 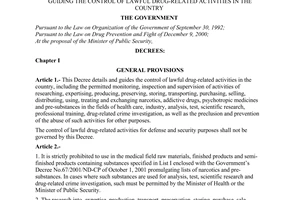 Responsibility of Ministry of Industry and Trade defined in the Law on Drug Prevention and Control: Ministry of Industry and Trade shall promulgate lists of industrial precursors, regulations on management of industrial precursors and organize the implementation of such regulations (Point a Clause 1 Article 41). 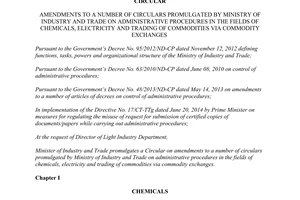 On the other hand, Ministry of Industry and Trade, pursuant to the Law on Chemicals, shall also manage chemicals used in industrial activities and chemicals which are industrial precursors (Point c Clause 1 Article 63). Regulated entities of the Decree No. 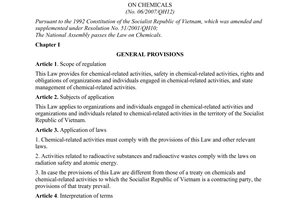 113 are specified in Article 2 of the Decree: “This Decree applies to entities performing chemical-related activities, and those involving in chemical-related activities in the territory of the Socialist Republic of Vietnam.” Thus, the Decree No. 113 only applies to activities related to chemicals, including elements, compounds and mixtures. According to the above-mentioned grounds, consumer products containing chemicals such as sulfuric acid used in lead-acid batteries, phenylacetic acid which is an auxin (a plant hormone) in fruits, phenylacetic acid used in certain types of perfumes, acetic acid (foods) used as organic solvent, pharmaceutical product, rubber, paint, dye, foods, fabric cleaner, etc., acetone contained in detergents, cleaning tools, or used to prepare 2-part epoxy, paint and varnish, tartaric acid used in foods, paint products, and inks containing precursors, etc. (as specified in the Official Dispatch No. 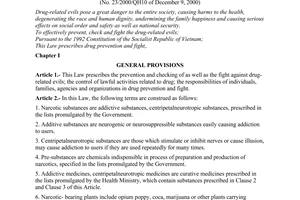 7678/TCHQ-GSQL) shall not be governed by regulations of the Decree No. 113. Regulations on exemption from the license to import/export industrial precursors as specified in Clause 1 Article 13 of the Decree No. 113 apply to imported/exported chemicals containing industrial precursors with the aims of simplifying administrative procedures as regulated in the Government’s Resolution No. 19. Thus, when importing mixtures that contain any substance that is on the list of chemicals subject to mandatory declaration (as regulated in the Appendix V of the Decree No. 113) and is classified as hazardous chemical, importers are required to make declaration of imported chemicals and when doing so, must specify substances whose names are stated in the Appendix V of the Decree No. 113. Regulation on content limits of chemicals subject to mandatory declaration in mixtures is not feasible because a substance may exist in various mixtures. Mixtures may differ in their components and contents thereof which influence on the hazard of mixtures. Hence, determining whether a mixture is hazardous and needs to be managed or not should be based on classification result of each mixture. With regard to imported chemicals, relevant agencies may refer to the classification of chemicals stated in the safety data sheets provided by manufacturers. 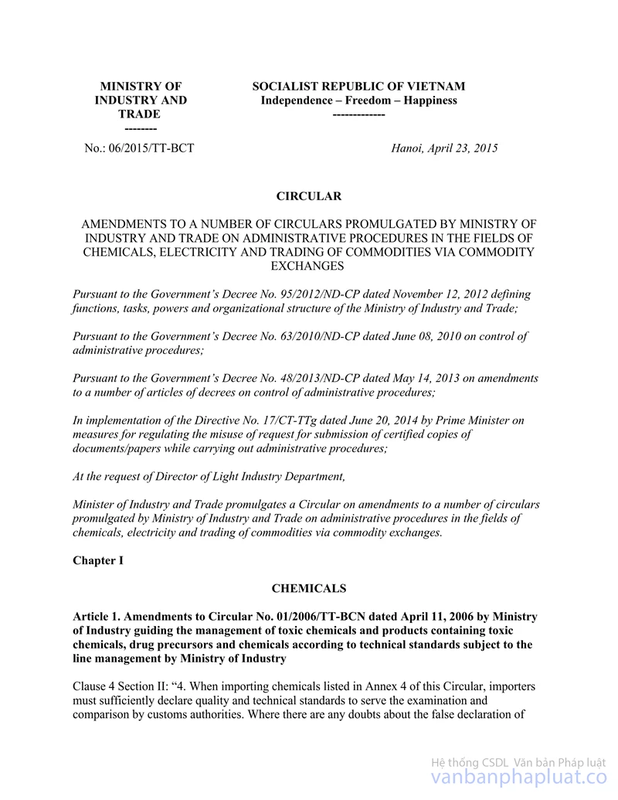 Procedures for declaration of imported chemicals specified in the Decree No. 113 have been simplified. An importer shall receive an automatic reply via the electronic system when sending a declaration of imported chemicals. Therefore, declaring chemicals when they are imported shall not make enterprises face difficulties or spend much of time and facilitate regulatory authorities’ collection of accurate data about quantity of chemicals imported into Vietnam. - Clause 3 Article 28 stipulates “The amount of imported chemicals is less than 10 kg/shipment". Pursuant to this Clause, the allowance of 10kg is applied to a chemical (excluding chemicals subject to restricted manufacturing/trading) per import shipment. This is not total amount of different chemicals. With regard to the example specified in Section 3.5.c.1 of the Official Dispatch No. 7678/TCHQ-GSQL because amounts of two imported chemicals are 5kg and 6kg, and smaller than 10kg, the importer is not required to make declaration of these imported chemicals provided that these chemicals are not subject to restricted manufacturing/trading. - With regard to mixtures: A mixture is also considered as a chemical according to the interpretation of terms prescribed in the Law on Chemicals. If a mixture contains any substance that is on the list of chemicals subject to mandatory declaration and is classified as a hazardous chemical, the mixture itself must be declared. The allowance of 10kg is applied to the mixture (as a whole) instead of its separate components. With regard to the example specified in Section 3.5.c.1 of the Official Dispatch No. 7678/TCHQ-GSQL if the mixture mentioned in this example is classified as a hazardous chemical, it must be declared when being imported and is not eligible for exemption from declaration of imported chemicals because the import amount is 11kg. Pursuant to Article 2 of the Decree No. 113 and the interpretation of the “chemical-related activities” term specified in Article 4 of the Law on Chemicals, organizations and individuals performing the investment, manufacturing, bottling, packaging, trading, import, export, transport, storage, preservation, use, research and testing of chemicals, and treatment of discarded chemicals and chemical waste, and organizations and individuals involved in such activities in the territory of Vietnam are considered as regulated entities of the Decree No. 113. However, when applying a regulation of the Decree No. 113 to a specific activity, regulatory authorities should base on specific contents of that regulation. 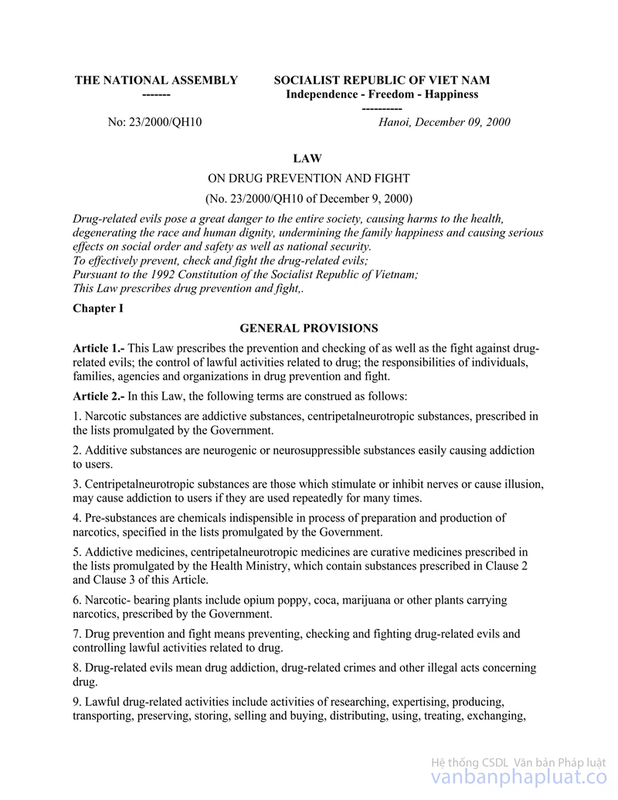 With regard to the case specified in Section 3.1 of the Official Dispatch No. 7678/TCHQ-GSQL because chemicals are imported for use, not for sale to earn profits, the importer is not considered as a chemical trader. However, this importer must comply with regulations of the Decree No. 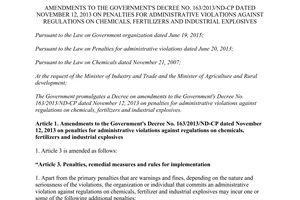 113 on import of chemicals, chemical safety, classification and use of chemicals, etc. 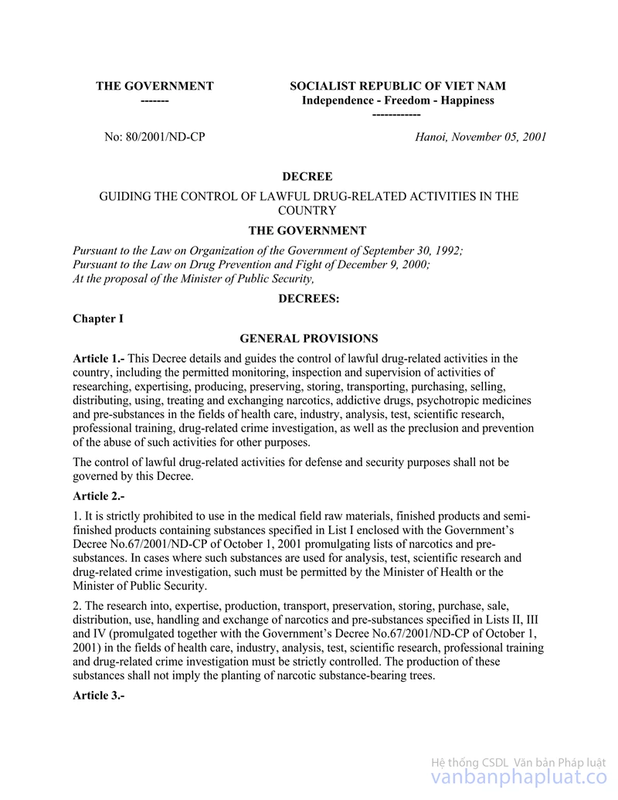 Importers must not present Certificate of eligibility to manufacture/ trade chemicals subject to conditional manufacturing/trading, License to manufacture/trade chemicals subject to restricted manufacturing/trading, written approval for the plan or measures for prevention and response to chemical emergencies and the record on sale of toxic chemicals when carrying out customs clearance procedures because the Decree No. 113 does not stipulate this. In order to serve the purpose of import management, chemicals mentioned in the Appendix I and Appendix II are also specified in the Appendix V and thus must be declared when they are imported. The Law on Chemicals only contains the regulation on preparation of the record on sale of toxic chemicals, and does not stipulate administrative procedures for toxic chemicals. 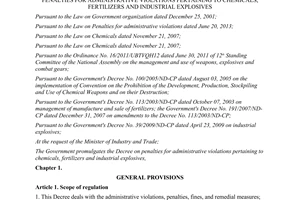 Toxic chemicals are classified on lists of chemicals enclosed with the Decree No. 113 according to their properties and risk levels, and managed in accordance with corresponding regulations. Currently, these regulations still remain valid and are applicable. Circulars providing guidelines about the Decree No. 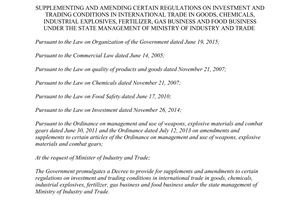 113 of Ministry of Industry and Trade shall inherit or maintain these regulations. Procedures for import/export of chemicals at bonded warehouses must be carried out in accordance with regulations on management of goods stored in bonded warehouses of the Law on Customs and the Ministry of Finance’s Circular No. 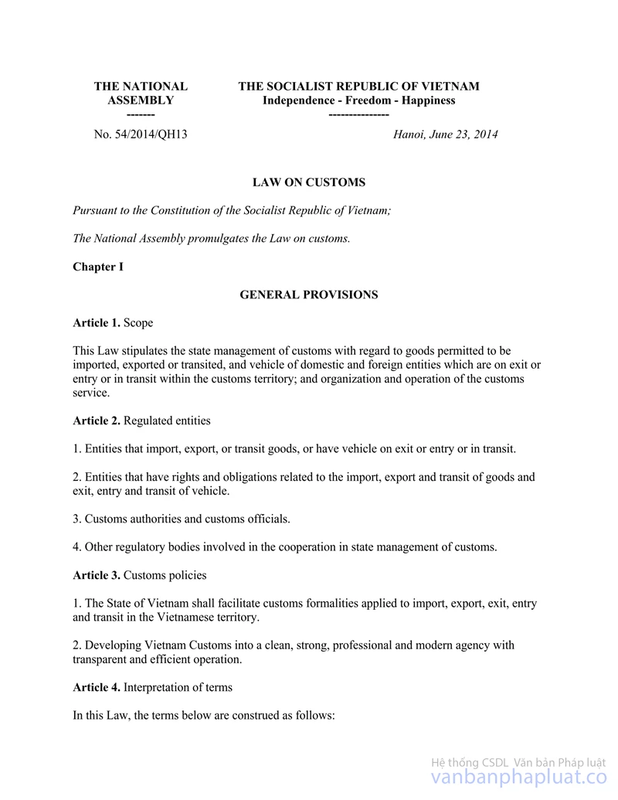 38/2015/TT-BTC A shipment of chemicals imported into the territory of Vietnam is required to be declared once only. 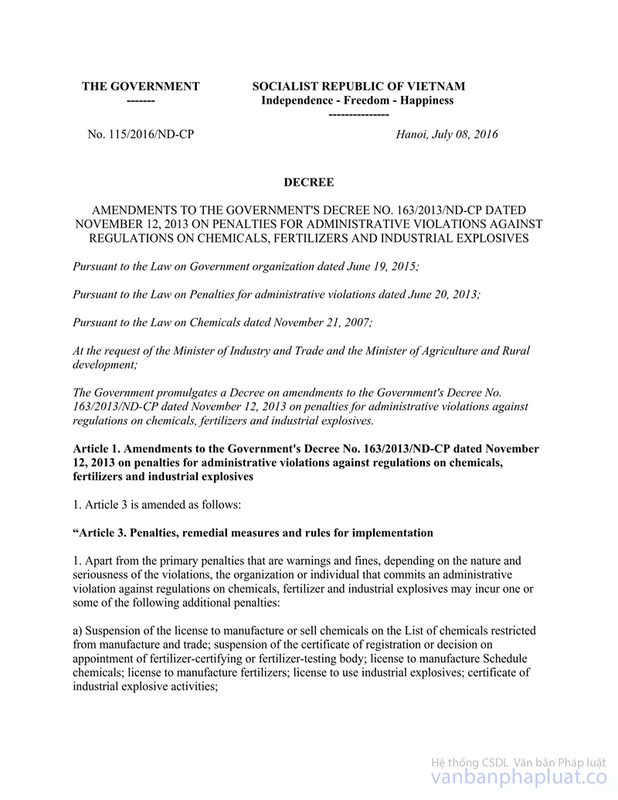 Penalties for violations against regulations on declaration of imported chemicals in particular and regulations on management of chemicals in general shall be regulated in the Decree on penalties for administrative violations. Ministry of Industry and Trade is studying the formulation of the draft Decree on penalties for administrative violations against regulations on chemicals so as to ensure its conformity to the Decree No. 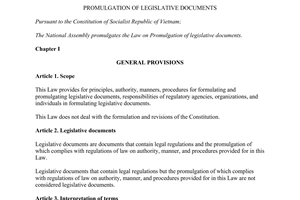 113 and supersede applicable regulations in the Decree No. 163/2013/ND-CP and the Decree No. 115/2016/ND-CP. - The Decree No. 113 does neither amend nor abrogate regulations on management of production and business activities in the Decree No. 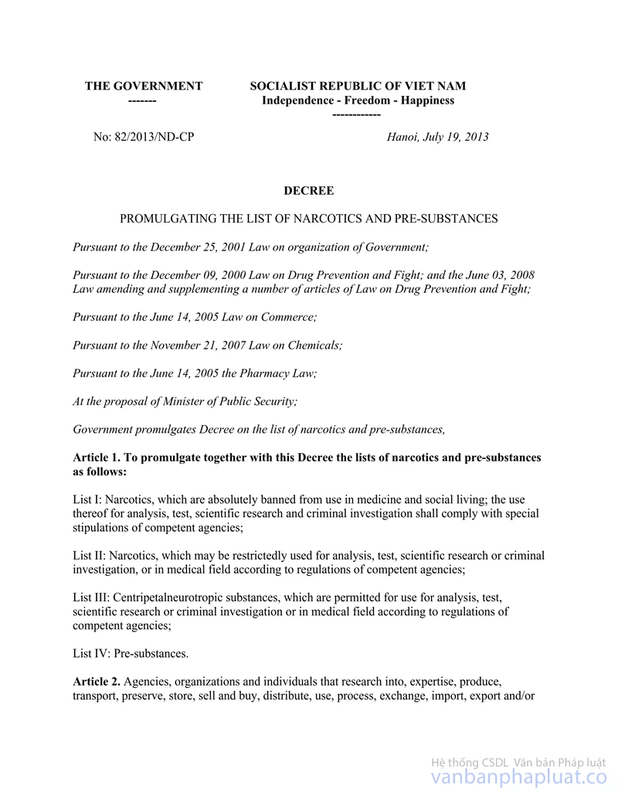 80/2001/ND-CP and the Decree No. 58/2003/ND-CP It only provides specific regulations on requirements for production and trading of industrial precursors. - Regulations on production, trading, import and export of industrial precursors in Article 12 and Article 13 of the Decree No. 113 inherit regulations of the Circular No. 42/2013/TT-BCT and the Government’s Decree No. 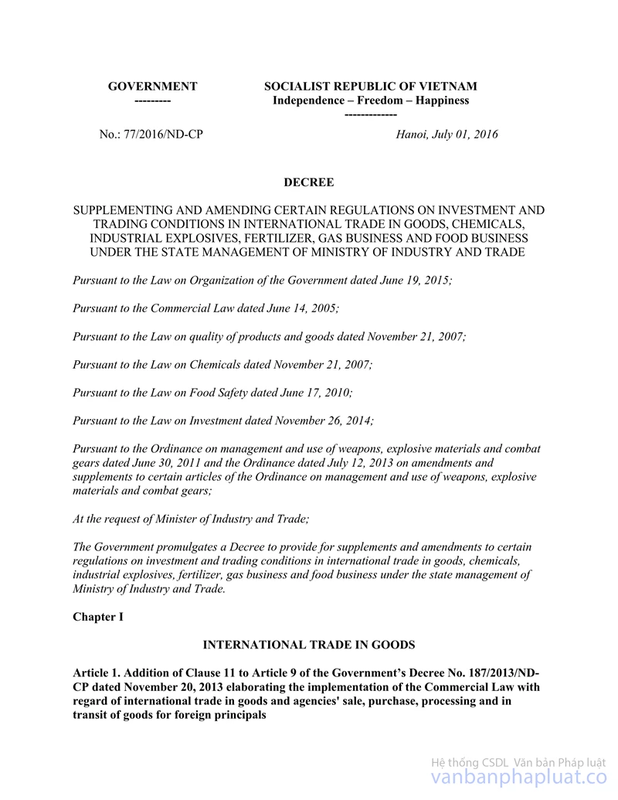 77/2016/ND-CP dated July 01, 2016 on amendments to regulations on investment and trading conditions in international trade in goods, chemicals, industrial explosives, fertilizer, gas business and food business under the state management of Ministry of Industry and Trade, and do not replace all regulations of the Decree No. 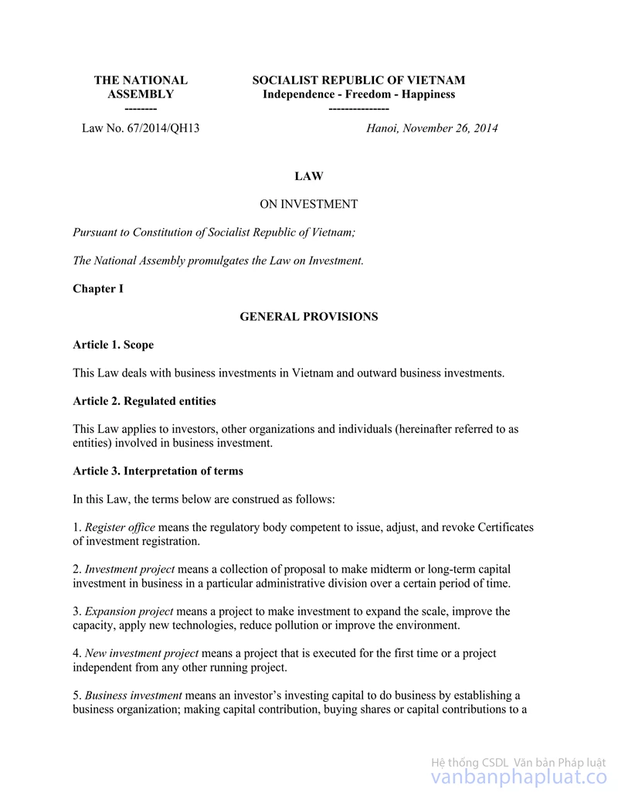 58/2003/ND-CP Article 12 and Article 13 of the Decree No. 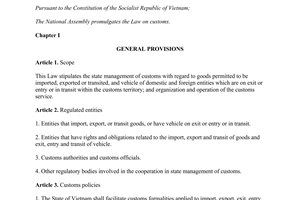 113 only apply to production, trade, import and export of industrial precursors while Articles 6, 7, 8 of the Decree No. 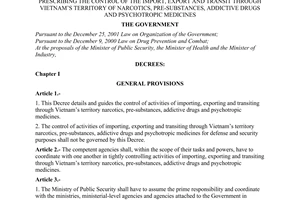 58/2003/ND-CP apply to production and import of both narcotic substances, precursors, narcotic drugs and psychotropic drugs. 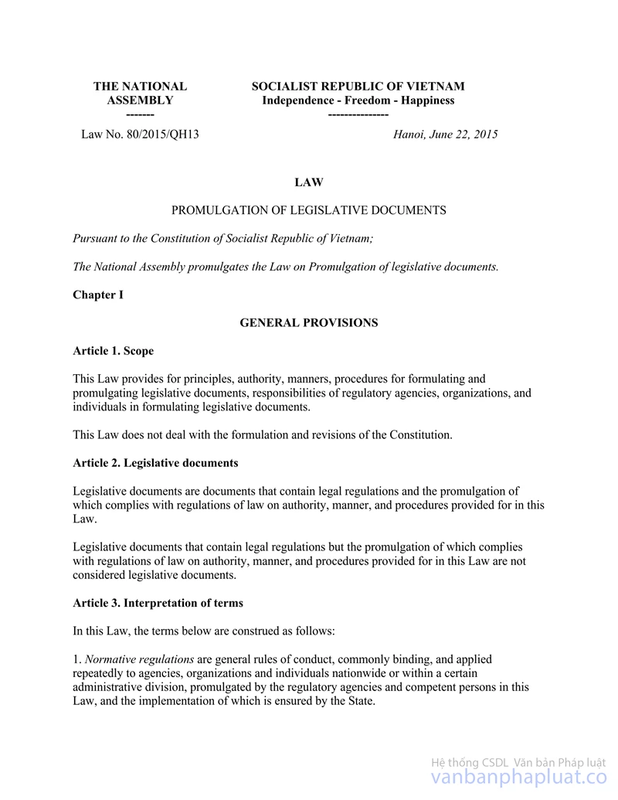 - Clause 3 Article 156 of the Law on Promulgation of Legislative Documents in 2015 stipulates “If various legislative documents promulgated by the same agency contain different regulations on the same issue, the one that is promulgated later shall apply.” Pursuant to this regulation, the licensing for import/export of industrial precursors shall be governed by regulations in the Decree No. 113. - In order to serve the Ministry of Industry and Trade’s management of production and trading of industrial precursors, Ministry of Industry and Trade has, in course of formulating the Decree No. 113, consolidated and put industrial precursors (previously on different lists) on the List of chemicals subjects to conditional manufacturing/trading. The Decree No. 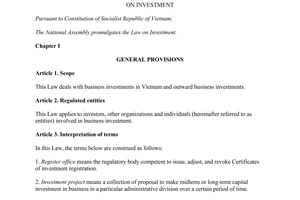 113 does not introduce a new List of precursors but cites and follows the List of industrial precursors enclosed with the Government’s Decree No. 82/2013/ND-CP dated July 19, 2013 and the Government's Decree No. 126/2015/ND-CP dated December 09, 2015. When Ministry of Public Security submits amendments to the List of industrial precursors to the Government for promulgation, the new list of industrial precursors shall apply. 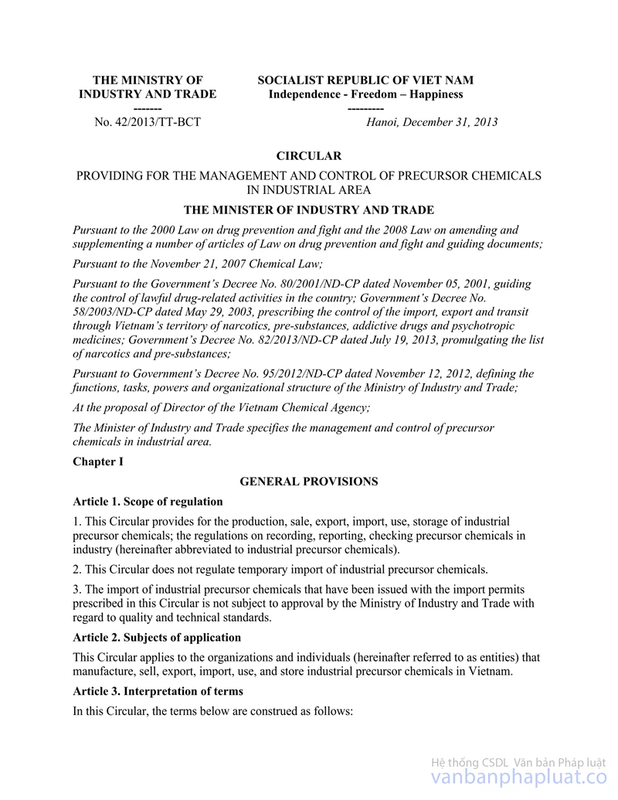 Putting industrial precursors on the List of chemicals subjects to conditional manufacturing/trading is conformable with regulations of the Law on Investment (which stipulates that industrial precursors are on the list of conditional business sectors) and used as a legal ground for management of production and trading of these substances without requiring further administrative procedures, since the satisfaction of requirements for production and trading of industrial precursors shall be appraised at the same time when appraising the satisfaction of requirements for issuance of the Certificate of eligibility to produce/trade other chemicals subject to conditional manufacturing/trading. 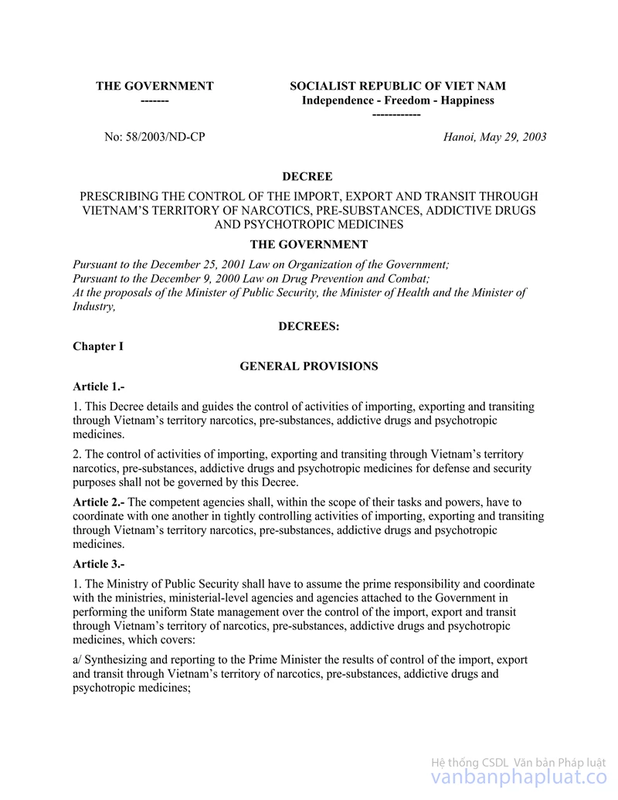 - The List of banned chemicals stated in the Appendix III shall apply to mixtures containing any substances on this list so as to meet the strict management requirements under international chemical conventions (such as Chemical Weapons Convention and Rotterdam Convention, etc.) adopted by most countries in the world. 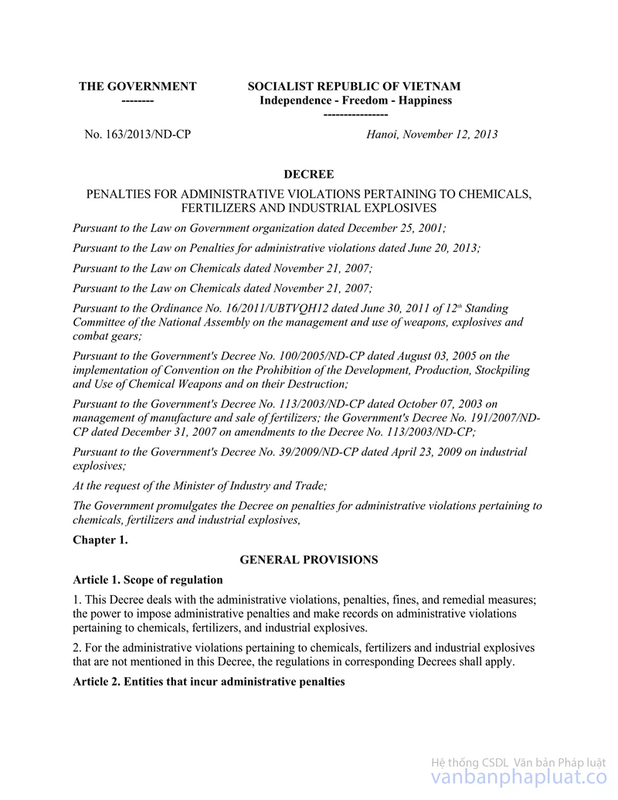 - The List of chemicals subject to mandatory declaration includes certain lines containing groups of chemicals such as mercury and its compounds, compounds of Cr6+, etc. Each of these groups of chemicals contains two or more chemicals with different CAS codes and HS codes, thus it is unable to apply CAS codes and HS codes to these groups of chemicals. The regulation on declaration of imported chemicals before customs clearance aims to facilitate importers’ declaration process and ensure that replies to importers' declarations of imported chemicals are available at the time when they carry out procedures for registration of customs declaration without causing difficulties to customs agencies' operations. - Response to the suggestion about abrogation of regulations in Clause 2 Article 8 and the Appendix 10 of the draft Circular (the suggestion stated in Section 4.2 of the Official Dispatch No. 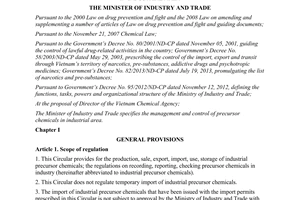 7678/TCHQ-GSQL): The Vietnam Chemicals Agency advices to preserve these regulations of the draft Circular because they specify technical contents so as to ensure a closed process when going through procedures for declaration of imported chemicals. 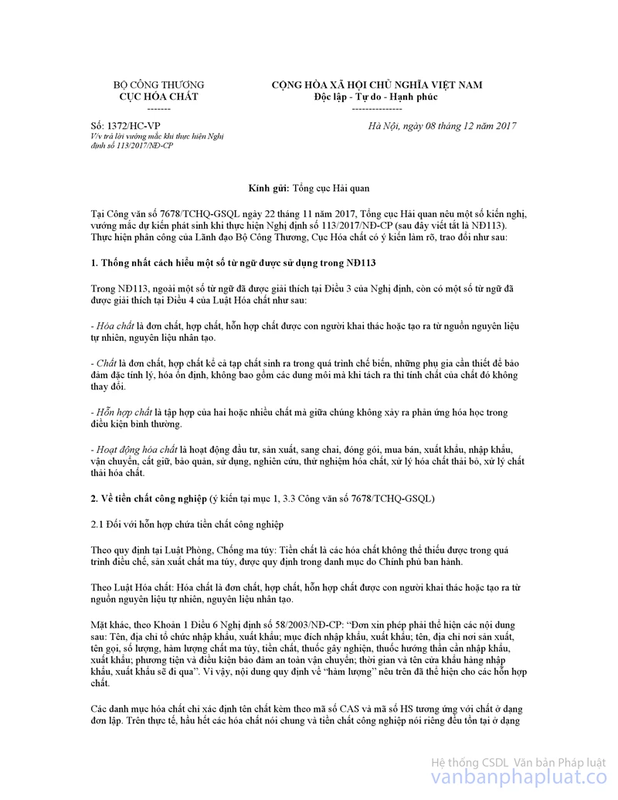 These are responses of the Vietnam Chemicals Agency to queries specified in the Official Dispatch No. 7678/TCHQ-GSQL dated November 22, 2017. The General Department of Customs is requested to disseminate to all customs agencies/ branches for implementation. law No. 06/2007/QH12 of November 21, 2007, on Chemicals.